“Introduction to the Devout Life”: St. Francis de Sales addresses Christians living in any state of life who want to grow in a personal relationship with Christ. He reminds readers that God made all of us with intentionality, and our goal should be to fulfill that. As he wrote, “Be who you are and be that well.” The book is composed in five parts, each relating to a particular stage on a person’s Christian journey, the third of which — on the practice of virtue — is most helpful in anyone’s life. These and other spiritual classics are available from Our Sunday Visitor’s Noll Library Classics. St. Marguerite d’Youville’s early life set the stage, in many ways, for a path that would lead her one day to being called “mother of universal charity” by Pope St…. St. Marguerite d’Youville’s early life set the stage, in many ways, for a path that would lead her one day to being called “mother of universal charity” by Pope St. John XXIII. After her father’s death, her young life existed within the bounds of a poor, fatherless home. Although she would go on to found the Sisters of Charity of Montreal — also known as the Grey Nuns — the young St. Marguerite ruled out religious life after a few years at a boarding school operated by religious women. The experience provided her with a firm education and deepened her faith. 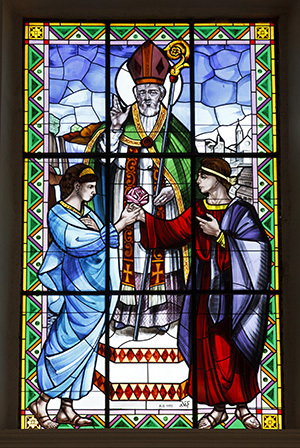 At age 20, St. Marguerite married François d’Youville in 1722. It was by no means an easy marriage. Her husband was frequently traveling for his business, which illegally sold liquor to the Native Americans in Quebec. To make matters worse, she was living with a domineering and harsh mother-in-law, living as if a captive in her own home. It was believed that St. Marguerite’s husband was adulterous on his work-related travels, but she lovingly and dutifully cared for him through his final illness. By age 29, she was a widow, and she experienced the death of four of her six children in infancy. This was a period of great trial in her life. Throughout it all, though, St. Marguerite acted with the greatest charity and humility. She put herself completely in the hands of God, knowing his plan for her would lead to her fullest joy. They were times that strengthened her faith and relationship with God. Little did she know, this would lead her back to the life of a religious — a life she previously had turned down in her younger years in order to pursue marriage. The widow operated a small store to provide for her two sons’ education; they both would go on to be ordained priests. During that time, St. Marguerite took a blind woman into her home. She developed a heart for the poor and sick — acutely aware of their needs — and responded to the Gospel mandate to care for the poor. Starting charitable work throughout the city on her own, quickly she was joined by others who desired to join in her work. Together they formed a community that became known as the Sisters of Charity in 1737. St. Marguerite was a pioneer in many ways. She advocated and fought for the rights of the poor, even when this caused great personal hardship for her. Among the taunts aimed at her out of hatred for her heroic work was that the religious order she founded was sometimes called the “tipsy” or “drunk” nuns because of the stories associated with her deceased husband. The phrase in French — les soeurs grises — can be rendered as “the Grey nuns” as they are still known today. Eventually called to put order into a Montreal hospital that was disintegrating and in need of dedicated leadership, St. Marguerite laid a foundation for her community’s outreach to untold numbers of the poor and sick throughout Canada in the decades and centuries to follow. After a fire destroyed her hospital a few years before the end of her life, St. Marguerite proceeded with faith and courage to rebuild. In 1990, St. Marguerite d’Youville became the first native-born Canadian to be canonized a saint. Although mostly remembered for her life and work as a religious foundress and servant of the poor, St. Marguerite is mostly sought after as a patron in a variety of familial situations desiring her intercession: troubled marriages, widows and those with troublesome in-laws. Her feast day is Oct. 16. Blessed Luigi and Maria Beltrame Quattrocchi have the distinction to have been the first married couple jointly beatified by the Church, sharing the same necessary miracle attributed to their intercession…. A childless uncle and his wife requested to raise and adopt Luigi as their own son. Agreed to by Luigi’s parents, he maintained a close relationship with them. In many ways this unique situation helped prepare Luigi for his vocation as a husband and father. Luigi studied law and went on to a distinguished career in civil service. Maria Corsini was introduced to Luigi through her father, who was a friend of Luigi’s adopted family. Maria was a woman of culture who loved music and was a professor and published writer in the field of education. She was very conscious of care to the poor and needy — on several occasions she volunteered with the Red Cross. During World War II, Maria oversaw the welcome of refugees into the family home and was generous with anyone who came to their door in search of life’s necessities. Married in 1905, the Quattrocchis had four children — two of whom became priests and one a nun. Their fourth child was born in 1913 after a long and painful pregnancy. The situation had been so dire that Maria’s physicians recommended an abortion, which she and Luigi both resolutely rejected. Together the Quattrocchis’ holiness grew by attending daily Mass and reciting the Rosary as a family each evening. They regularly took part in retreats and participated in theology courses at Rome’s Pontifical Gregorian University. Their family participated each month in a Eucharistic vigil associated with the First Fridays devotion, as they were consecrated together as a family to the Sacred Heart of Jesus. The Quattrocchis were visionary in their desire to spread the Gospel in the social sphere. They are counted among the founders and organizers of three apostolates, including Italian associations for Catholic scouting and laity, as well as a charitable organization founded to bring sick and infirm pilgrims to Lourdes and other shrines. Their feast day is Nov. 25. Saints Cyril and Methodius were born in modern-day Greece and believed to be the oldest and youngest boys in a family of seven children. Promising careers awaited both of them, as well as comfortable lives of privilege given their nobility. Methodius, originally named Michael, climbed the ranks of civil service through political and administrative service — for a time he served as a governor on behalf of the emperor. Cyril, originally named Constantine, was on track to obtain a prestigious, lifelong academic post. Both were destined by God’s providence for another path, however. Unsatisfied with what they had and yearning for more, which they knew was only to be found in God, they gave up the positions and career paths that awaited them, opting for lives of deeper devotion to God. Serving God more directly in their new vocations, Cyril and Methodius found that the Lord used their gifts and talents in a way more profitable to advancing the kingdom. Having obtained theological mastery in his scholarship, Cyril’s skills were useful in delicate negotiations on behalf of the emperor. He was ordained a priest after completing his education and became a monk not long before his death. Methodius became a monk earlier in life and served as a deacon and abbot for many years, before being ordained a priest and later a bishop after Cyril’s death. In 862, through the Byzantine emperor, God called the holy brothers to the important evangelical work that would define their lives and ministry — and eventually earn them the title of co-patrons of Europe. It was likely, just as much for political reasons as religious, that the prince of the Great Moravian Empire called upon the Byzantine emperor’s assistance in spreading Christianity among his realm. But through this, God allowed Saints Cyril and Methodius to build up a civilization and culture that made Moravia shine as a model of Christian society. While Christianity already had been present in Moravia, it was widely rejected. So the prince desired a fresh approach to spreading the Gospel among his people. Cyril and Methodius took an inventive approach to bringing the Good News to the people of Moravia. Their efforts were rooted in translating the Bible into a language that would be intelligible to the Moravian people. This required standardizing and codifying a language from among the disparate parts of Moravia. St. Cyril is credited with devising the Glagolitic alphabet — the oldest Slavic alphabet and the foundation for the modern Cyrillic alphabets — named after the saintly linguist and still used throughout Eastern Europe and northern and central Asia. Cyril and Methodius also sought papal approval for a translation of the liturgical rites into the same language in which they translated Scripture. Several Orthodox and Eastern Catholic Churches still use Church Slavonic as their liturgical language. Not everyone appreciated the efforts of Cyril and Methodius, particularly the Germanic bishops who complained about them to the pope. They were summoned to Rome in 867, and they arrived the following year — where they greeted a new pope, Adrian II. They brought along the relics of St. Clement, the fourth pope. It was then that the pope gave permission for the liturgical translation they produced, and he ordained Methodius and several of their followers to the priesthood. St. Cyril died in Rome in 869 and St. Methodius returned to labor another two decades in Moravia — most of those years as an archbishop, an office he had been appointed to by the pope for his loyalty to Rome and which cost him much, including imprisonment. He died in 885. Their feast day is Feb. 14. When Saint Francis de Sales was born in 1567 in Thorens-Glières, France, his father had his life planned out for him. This life would be one of nobility, with a career in law that would culminate with his appointment as a magistrate. Francis’ earthly father planned a prosperous and prestigious future for him, but it turned out that his heavenly Father had other plans. The saint’s early life began with academic training close to home at a school for sons of noblemen, specializing in composition. He then studied philosophy, rhetoric, and theology at a Jesuit-run college in Paris. After obtaining his baccalaureate degree in 1584, Francis continued to study theology in Paris as he grew in his own practice of the Faith. He earned two more masters’ degrees, followed by a doctorate in law in Padua, Italy, in 1591. During his doctoral defense, his oratory skills and intellectual prowess left all forty-eight professors amazed. Because he was of noble origin, Francis was accompanied during most of his studies by a servant and a priest-tutor. In addition to his academic pursuits, he also received “gentlemanly formation,” including lessons in dancing, fencing, and boxing. He excelled in horsemanship, especially jumping and dressage. As Francis was receiving his education, the doctrine of Calvinism was taking root throughout Europe, causing many Catholics to break away from the Faith. This would touch Francis’ life in many ways, both professionally and personally. As various Calvinist doctrines were debated publicly, especially in Paris during his time of study there, briefly he became convinced of predestination, a primary tenet of Calvinism. In 1586, a period of depression and spiritual darkness struck Francis, growing out of an experience in which he became convinced that he was predestined for eternal damnation. This consumed him for nearly two months, leaving him emotionally and physically exhausted. While visiting a famous chapel in Paris, dedicated to Mary under the title of Our Lady of Good Deliverance, Francis completely abandoned himself to the will of God, promising to love and serve God no matter what was in store for him. His eyes were drawn to an inscription of the Memorare, a prayer to Our Lady composed by Saint Bernard of Clairvaux, on the chapel’s wall. He felt immediate peace and tranquility as a result of his newfound trust and confidence in God through Mary’s intercession, and he vowed to recite this prayer every day of his life from then on. Francis’ ordination came about quickly when he was nominated (without his knowledge) by a priest-cousin to be provost of Geneva, a position second to the bishop. He rose to prominence quickly within the local Church of Geneva, although Catholic leadership was exiled to eastern France because of the Calvinist occupation of the city. Through his preaching and teaching, Francis manifested great evangelical skills for overcoming the divide between Catholics and Calvinists. He accomplished this mostly through tireless efforts of preaching and the publication of various tractates in which he put forward the teachings of the Church in simple, understandable language. More than two-thirds of the population of Chablais, the region in which Francis labored for about four years, returned to the Church, and a revival of Catholic practices thrived thanks to his leadership. It is believed that a deceased Protestant child came back from the dead long enough for the saint to perform the baby’s baptism. And Pope Clement VIII even asked Francis to seek out Calvinist leader Theodore Beza, then in his early eighties, and persuade him to come back to the Church. None of Francis’ missionary work among the Calvinists came without great personal cost to him, however. On several occasions, he came close to martyrdom. Forced to live in a garrison, his health deteriorated. Once, he even had to spend a night in a tree in order to avoid being attacked by wolves. Interestingly, even while he preached the truth of the Catholic faith, old theological doubts tempted him again, especially regarding the primary Calvinist tenets on predestination, grace, free will, and the Real Presence of Christ in the Eucharist. To make matters worse, his father cut off all material assistance to him in hopes that he would abandon his mission. Yet, through it all, Francis persevered, forced to depend solely on the providence of God, something in which he rejoiced greatly. Francis eventually was named coadjutor to the bishop of his exiled Geneva see, succeeding him in 1602. As the diocesan bishop, he was responsible for implementing the reforms of the Council of Trent, saying, “The first duty of the bishop is to teach.” Much of his tenure as bishop was spent doing just that, especially as he fulfilled the task set out by Trent to visit all the parishes and ecclesial institutions in his diocese. Francis forged a strong bond with his people and left a major mark through his teaching, preaching, and example. During this time, he also developed a deep, loving, spiritual friendship with a widow named Jane Frances de Chantal. Together the two founded a new women’s religious community, the Order of the Visitation of Holy Mary, which was less strict than many orders of the time and open to older women and widows who wanted to live a life dedicated to development of the interior life, particularly humility and gentleness. Francis served as Jane’s spiritual director for many years, and their correspondence remains among the most treasured in that genre of spiritual writing. Francis is remembered as a uniquely gifted spiritual director, and his writings were unique because of his strong belief that anyone could serve God in any vocation. This was a striking departure from the common thinking of the day, which held that entrance to a religious community or the clerical state was really the only path to holiness. But Francis insisted that everyone is called to holiness, and this was the major theme of his Introduction to the Devout Life, a collection of letters between himself and a cousin’s wife, whom he served as spiritual director. Considered too lax at the time, the work is now noted for its spiritual rigor. It was an immediate best-seller and remains one of the most loved spiritual books of all time. Francis’ last years were spent dealing with increasing health problems, but his attention shifted also to continued writing and work with the Visitation nuns. In addition, he was called upon numerous times to perform careful ecclesiastical and political negotiations. A variety of arduous and taxing journeys in his last years took a toll on him. He suffered a stroke, and while he lay on his deathbed, a nun begged for some last advice. Given paper and pen, he wrote three times, “Humility.” Francis died on December 28, 1622, in Lyon, France. He was canonized in 1665, named a Doctor of the Church by Blessed Pope Pius IX in 1877, and formally named patron of writers in 1923. Michael R. Heinlein is editor of Simply Catholic. Follow him on Twitter @HeinleinMichael. This biography was first printed in Introduction to the Devout Life by St. Francis de Sales, part of Our Sunday Visitor’s Noll Classics series.